Batur region is a volcanic mountain region. 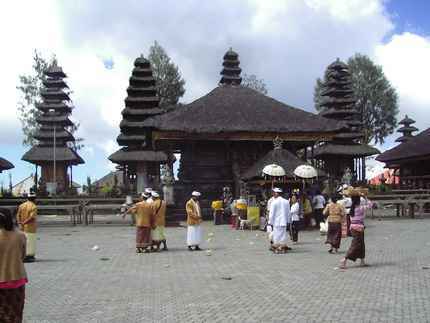 Its located in Bangli regency, Bali, is a province of Indonesia. Mount Batur Bali is a place for the gods and the ancestors. At lake Batur there are also a source of water in most areas in Bali. Because of the uniqueness strutur, geographic location, and condition of society, UNESCO added the Batur Bali into a global geopark network. That is part of the four new locations. Besides Indonesia from Batur located in Bali, there are three countries into a global geopark network, namely China, Hungary and Spain. Thus increased to 21 countries, with 91 points coming into the global geopark network. Global geopark network that was created with the support of UNESCO, in 2004, to encourage cooperation between geological heritage experts and practitioners, connecting important geological heritage sites, rare or beautiful in the world. And is also used to promote sustainable development in local communities. Batur enactment, as a global geopark network, so that Bali had the opportunity to obtain sustainable development opportunities, for local people. And for Indonesia to take part in the cooperation between experts and practitioners geological heritage.